Can IRS Tax Debts be Discharged in Bankruptcy? | The Law Office of Emil Fleysher, P.A. Can IRS Tax Debts be Discharged in Bankruptcy? | The Law Office of Emil Fleysher, P.A. Home Blog Bankruptcy Can IRS Tax Debts be Discharged in Bankruptcy? Income taxes, both federal and state, over 3 years old can be discharged in bankruptcy if the returns have been filed by the debtor at least 2 years before the bankruptcy is filed. The 3 year period begins running from the due date for the return, which is the 15th of April of the following year, unless an extension to file was granted. The returns had to be filed by the debtor. If the IRS or state filed the return, then the 2 years has not yet started to run and the tax is not dischargeable. It is important to obtain transcripts to determine if federal taxes are dischargeable. 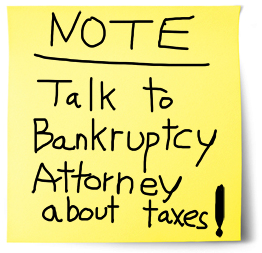 Filing a bankruptcy even 1 day early can mean the tax won’t be discharged! If you have questions about Ch. 7 or Ch. 13 bankruptcy, or other alternatives, please feel free to call my office at 888-886-0020, send an e-mail to emil@fleysherlaw.com, or complete the contact form below.